What if the Earth/Mars battle from H.G. Wells' classic novel The War of the Worlds wasn't fiction but actually fact? That's the story of WAR OF THE WORLDS THE TRUE STORY, one of 208 contenders for the 85th Academy Award Oscars, including consideration for best adapted screenplay, best editing and best original score. Like the famous 1938 Orson Welles radio broadcast that caused Americans to believe an actual invasion was in progress, the movie assumes an Earth/Mars War actually occurred in the year 1900 and is presented as the eyewitness memoir of journalist Bertie Wells, the last living survivor as he struggles to find his wife amidst the destruction of humankind at the hands of terrifying alien invaders. 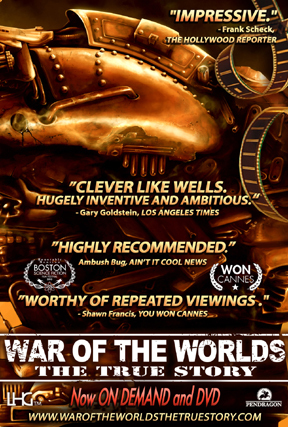 Critic Gary Goldstein of the Los Angeles Times said, "’War of the Worlds The True Story is clever like Wells. Hugely inventive and ambitious, a mock sci-fi docudrama packed with a truly impressive — and clever — mix of editing (a reported 3 1/2 years' worth), special effects, visual artistry and offbeat storytelling." Frank Scheck, critic of The Hollywood Reporter called the movie, "Impressive for its technical achievements...Director/Editor Hines weaves the various styles of footage together in expert fashion." "Ever since the 1953 movie adaptation of War Of The Worlds there have been numerous other translations of Wells’ novel, even a 1988 short lived TV series, but of all the ones I have seen the only two—yes, only two—I find worthy of repeated viewings is the ’53 film and this new 2013 docudrama." - Shawn Francis, You Won Cannes. “I loved this movie…it’s the ultimate ‘what if?’ movie…Buy it, watch it, and relive the classic. You won’t be sorry!” - Dave Reneke, ASTRO SPACE NEWS Australia's #1 Astronomy News Service. The movie review site Apocalypse Later lavishes raves for WAR OF THE WORLDS THE TRUE STORY, a movie that competed in the 85th Academy Awards and has gained critical acclaim from critics and movie audiences. The movie uniquely uses Cutting Edge Visual Effects to blend a modern cast with Battalions of Actual Fighting Soldiers, Golden Age Movie Stars, and previously undisclosed images of Tentacled Alien Creatures and their 10-Story High, 3-Legged Fighting Machines. 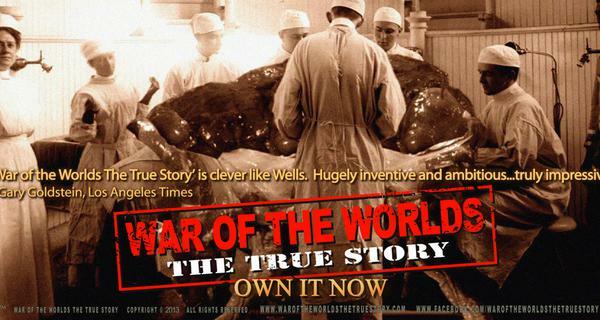 War Of The Worlds The True Story Trailer 2 - Oscar®Contender ON DVD & ON AMAZON! from PENDRAGON PICTURES on Vimeo. AMAZON PRIME - Watch for 0.00 with a Prime membership. Rent or buy AMAZON U.S. here. UNITED KINGDOM - Rent or buy AMAZON UK here. EUROPEAN UNION - Rent or buy AMAZON EU here. JAPAN - Rent or buy AMAZON JAPAN here. DVD - Buy DVD worldwide here.